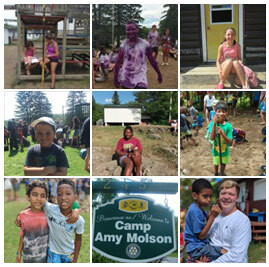 Your donation to Camp Amy Molson goes towards the $300 we need to subsidize the stay of each camper. Any donation you give us helps us immensely and ensures our campers can grow up to make an impact on our entire community. You see that guy up there yelling at the top of his lungs? That’s Derek. Almost a decade ago, he came to Camp Amy Molson as a first-time camper. Back then, he struggled with a learning disability and issues with his home life. He had no idea what it was like to canoe, hunt for frogs, or plant vegetables in a real garden. At Camp Amy Molson, he discovered lush green foliage instead of the cement streets and apartment buildings of his tough Lachine neighbourhood. He made friendships, connected with people, and found self-confidence. Derek is now one our Camp Leaders. And he is just one of our success stories. 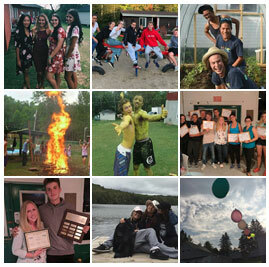 Many children come to Camp Amy Molson to learn that life holds extraordinary opportunities, no matter what their abilities, no matter what their background, and no matter what path other people say their life is supposed to take. For example, Derek continues to help Camp Amy Molson not only as a staff member and but as a donor. In fact, he has such pride in our camp, he donated $1,000 to help us succeed in our mission! Please join Derek in giving to Camp Amy Molson and experience the same pride that we all feel in teaching kids the essential skills they need to transform their lives. Your donation to Camp Amy Molson goes towards the $250 we need to subsidize the stay of each camper. In other words, your donation helps us keep the lights on, the cupboards stocked and our kids learning! Any donation you give helps us immensely and ensures our campers can grow up to make an impact on our entire community. All donations are tax deductible and receipts will be issued for all contributions of $10 or more. For more information on Camp Amy Molson and how you can help please contact us at office@campamymolson.com or by calling us at (514)484-9919. If you are interested in donating or contributing a portion of the funds needed to any of the above Wish List items please contact us for more details. Camp Amy Molson would like to thank its Donors and Sponsors. With your support we continue to provide our campers with a happy and rewarding experience! Camp Amy Molson is an affordable sleepaway summer camp for Montreal children, aged 5 to 14 years old. Camp Amy Molson offers 3 sessions of 15 days each. The staff-to-camper ratio is better than one to three, so that all the youngsters are guaranteed very personal care. With a sliding fee scale, Camp Amy Molson tries to make camp an affordable option to all families.